So, on her parenting blog on Kveller.com, she writes about trying to get her money back for a flight she had unwittingly booked on the second day of Shavuot. She describes the beauty of the mikve on Jewishweddingnetwork.com, explains Purim on the television program Attack of the Show and shared her “Top Seven Amazing Cool Things in Judaism” at TribeFest’s 2011 gathering of young adults in Las Vegas. “Being Jewish is such an integral part of my existence I don’t even think of it as a separate identity,” says Bialik during a visit to New York from Los Angeles, where she lives. She enumerates her other identities: mother (her priority), actor (a job), neuroscientist (like her onscreen persona, she is passionate about the study of the brain and nervous system), writer (her creative outlet), teacher (she has taught neuroscience, biology, chemistry and dissection for her homeschool community). She wears these identities layered—quirky and eccentric, rather like her offbeat yet proper outfit: knee-length jeans skirt, dusty rose ruffled blouse, kelly green sweater and dark green knotted scarf. Oh yes, she has 14 ear piercings (8 in one ear and 6 in the other), mostly remnants of teen rebellion. 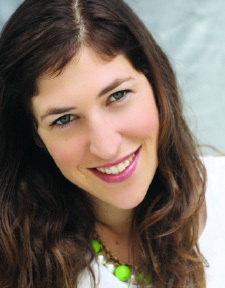 “Mayim is energetic…principled and caring. She’s the most down-to-earth person you’ll ever meet,” says Shari Rosenman, one of the founders of LA Jewish Homeschoolers. “Her biggest contribution is being a role model for females. She shows that females can be smart, nerdy and serious, but also pretty and interesting. She shows that females can be successful in Hollywood without dressing and acting in a sexualized manner. She shows that it’s cool to be a Jewish female.” Rosenman’s teenage daughter has become inspired by learning with Bialik and has expressed interest in pursuing a career in science. Bialik has a good sense of humor, Rosenman adds: For an end-of-the-year neuroscience party, she brought kosher candy that looked like eyeballs and brain matter. Bialik’s one-bedroom home is furnished with Ikea wood pieces with eclectic touches and buckets of toys integrated into corners. “It’s a very Jewish house,” Bialik says. “I kept everything from my grandparents that I could. All my grandmother’s platters that she brought from Poland. Her needlepoint of the kotel.” A wall of photos displays pictures of her ancestors from her great-grandfather down, but does not include her great-great-grandfather’s uncle, Hayim Nahman Bialik, Israel’s national poet. Bialik talks with reverence about her family. Three of her grandparents fled the pogroms in Poland and Czechoslovakia/Hungary in the 1930s. Her maternal grandparents were tailors in the sweatshops of the Lower East Side; her paternal grandfather was an accountant and her grandmother, a homemaker. Her parents, Beverly and Barry, both English teachers, documentary filmmakers and antiwar activists, grew up in homes filled with joy and love but also a tremendous amount of anxiety and sadness. Because they associated that anxiety with Judaism, they left Jewish ritual behind when they married, moved from New York to California and raised Bialik and her brother, Isaac, in an earthy, hippie, Yiddish-infused environment. Bialik always enjoyed making people laugh. She acted in elementary school plays and began auditioning professionally at 11. Beaches came out the week of her bat mitzva. “Life changed overnight,” she recalls. “I didn’t realize a year later I would have my own show.” Blossom, about a divorced dad and his family, ran from 1990 to 1995. The floppy-brimmed “Blossom hat” with its oversized flower became a fashion necessity for teens. She has also appeared in Woody Allen’s Don’t Drink the Water and had a recurring part in Larry David’s Curb Your Enthusiasm. Her far-ranging creativity has been instilled in her since her childhood. She plays and teaches piano, sews, bakes, cooks and hopes to “make every delicious Jewish food vegan.” Her specialties are Hungarian strudel and hamentaschen filled with chocolate, nuts and jams. She enjoys quilting, assemblage (she creates hamsas from found objects and photos), reads and rereads serious study material (currently Rabbi Akiva Tatz on Jewish thought and philosophy) as well as lighter fare (Faye Kellerman mysteries) and has even started composing her own music. At UCLA’s Hillel, she led a Rosh Hodesh group; became a lay hazzan; conducted, arranged music for and sang with the college’s a cappella group; battled anti-Zionism; redid the Friday night siddur; and began her path to more Jewish learning. She minored in Jewish and Hebrew studies, continued studying with her husband-to-be toward his conversion and, despite her skepticism, prepared for marriage with a kalla teacher. She became entranced with the mysterious process of the mikve and the transformative power of water, intrigued by her own name: Mayim Hoya (Chaya) means “living waters” in Hebrew. She took to Judaism like a scientist. “‘Intellect is the glory of God,’” Bialik quotes Maimonides. “Judaism is a religion of analysis. We are raised with text in our ears and tension in our hearts.” Study, she says, keeps her mind active, distracts her from pettiness and binds her to millennia of Jews. Academia and motherhood edged style practically out of Bialik’s vocabulary. When the hosts of TLC’s reality show What Not to Wear snagged her on the streets of New York in 2009, they intoned that Blossom had “seriously wilted” and become a “fashion fiasco.” Videos of her going about her daily life showed her in oversized and dated tops, voluminous coats and mid-calf skirts—even in her grandmother’s favorite cardigan—which she accessorized with knee socks and Army boots. The crew threw out her wardrobe (she rescued the cardigan), restyled her hair and makeup and created a more sophisticated look. “It highlighted the need to be seen as competitive esthetically,” Bialik says. She relies on a girlfriend and an unofficial stylist to ready her for red carpet events and other important occasions. Rahel Musleah’s Web site is www.rahelsjewishindia.com.